For our final project in Interaction Design during the Fall of 2014, we were tasked with developing a concept and designing a service for social good. I came up with the idea of TennsInvolved, an incentive-based platform for teens to find volunteer opportunities. While I was brainstorming about how I would approach, my initial idea was for a platform for teens to find extracurricular activities in their community. These activities would be crucial in their college application process. I wanted to find a way for students in underserved schools to be competitive applicants. I assumed that some schools did not have the funding to provide enough options for their students to get involved outside of class. In order to investigate, I conducted guerrilla research with 10 students from Newtown High School in Elmhurst, NY. My findings invalidated my assumptions. As it turned out, Newtown had a wide range of activities and no students had trouble finding their interest. However, I found that the students that were not as active in those activities lacked an immediate incentive. Instead of extracurricular activities, I pivoted the focus to volunteer opportunities because many teens I spoke to did not find many available resources. After going back to the drawing board, I found that one way to motivate students was to find breadcrumbs of incentives. As such, I came up with a gamification system that would give teenagers small rewards after completing a volunteer opportunity. 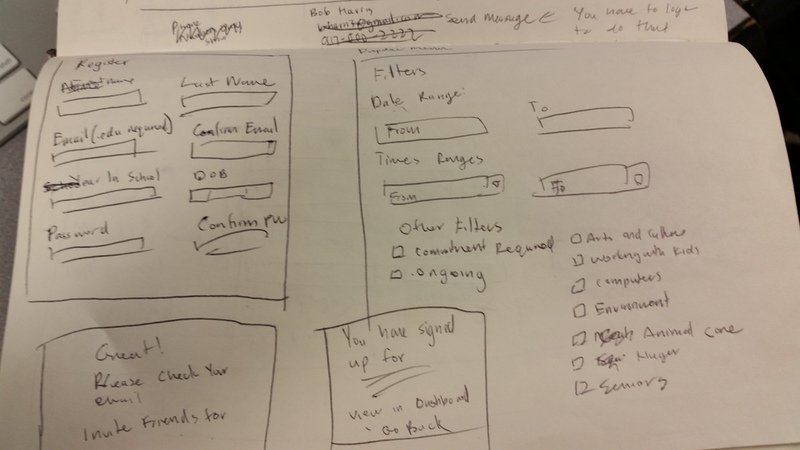 I sketched the wireframes on paper and moved on to complete a high-fidelity prototype in Photoshop. I wanted my design and color choices to have a very open and modern vibe, hence why I choose a bright side of green and used Gotham as the primarily body font. I also created a clickable prototype through InVision. My project received an A- from my Professor. This was my first time conducting research and undertaking a UX project from the ground up. Although this was merely a concept, I developed important skills in user interviews, product development, and UI design. If I had the time to take this project to the next level, I would have conducted user testing on the prototype and iterated based on the feedback. I also learned that Photoshop is an extremely time consuming tool for UI, long live Sketch!